WALTHAM, Mass.--(BUSINESS WIRE)--Kala Pharmaceuticals, Inc. (NASDAQ:KALA), a biopharmaceutical company focused on the development and commercialization of therapeutics using its proprietary AMPPLIFY™ mucus-penetrating particle (MPP) Drug Delivery Technology, today announced the launch of INVELTYS™ (loteprednol etabonate ophthalmic suspension) 1%, the first and only twice-daily ocular corticosteroid indicated for the treatment of post-operative inflammation and pain following ocular surgery, and the hiring of the specialty ophthalmology sales organization. INVELTYS is now in national and regional United States (U.S.) pharmaceutical distribution centers, and patients have access to INVELTYS through their local retail pharmacies. A highly experienced ophthalmology specialty sales force of 57 territory sales managers has been hired, trained and deployed. The territory sales managers have on average more than eight years of ophthalmic sales experience and more than 13 years of pharmaceutical sales experience. An experienced sales leadership team has also been hired, with on average over nine years of ophthalmic sales experience and nearly eight years of pharmaceutical sales leadership experience. In addition, the payor account team, which averages over 16 years of account director experience, is actively engaged in contract discussions with Commercial and Medicare Part D health plans. INVELTYS was approved in August 2018 as the first and only twice-daily ocular corticosteroid indicated for the treatment of post-operative inflammation and pain following ocular surgery. INVELTYS utilizes Kala’s proprietary AMPPLIFY Drug Delivery Technology to enhance penetration into target tissues of the eye. In preclinical studies, the AMPPLIFY technology increased delivery of loteprednol etabonate (LE) into ocular tissues more than three-fold compared to current LE products by facilitating penetration through the tear film mucins. The AMPPLIFY technology also underpins KPI-121 0.25%, a product candidate for the temporary relief of signs and symptoms of dry eye disease utilizing a two-week course of therapy. Kala filed a New Drug Application (NDA) for KPI-121 0.25% with the FDA and has been granted a PDUFA target action date of August 15, 2019. Based upon the FDA’s recommendation, Kala also initiated an additional Phase 3 clinical trial in July 2018, STRIDE 3 (STRIDE - Short Term Relief In Dry Eye), evaluating KPI-121 0.25% for the temporary relief of the signs and symptoms of dry eye disease. The Company expects to report top-line results for STRIDE 3 in the fourth quarter of 2019. 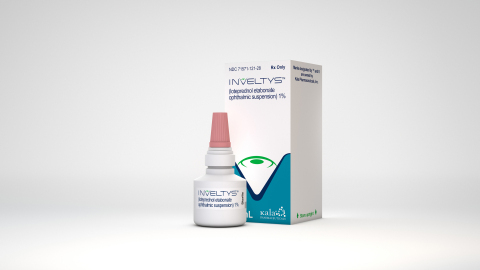 INVELTYS™, as with other ophthalmic corticosteroids, is contraindicated in most viral diseases of the cornea and conjunctiva including epithelial herpes simplex keratitis (dendritic keratitis), vaccinia, and varicella, and also in mycobacterial infection of the eye and fungal diseases of ocular structures. Kala is a biopharmaceutical company focused on the development and commercialization of therapeutics using its proprietary AMPPLIFY™ mucus-penetrating particle (MPP) Drug Delivery Technology, with an initial focus on the treatment of eye diseases. Kala has applied the AMPPLIFY Drug Delivery Technology to a corticosteroid, loteprednol etabonate (LE), designed for ocular applications, resulting in recently approved INVELTYS™ for the treatment of inflammation and pain following ocular surgery and its lead product candidate, KPI-121 0.25%, for the temporary relief of the signs and symptoms of dry eye disease, for which a New Drug Application (NDA) has been filed with the United States Food and Drug Administration (FDA) and a target action date under the Prescription Drug User Fee Act (PDUFA) has been set for August 15, 2019. This press release contains forward-looking statements within the meaning of the Private Securities Litigation Reform Act of 1995, that involve substantial risks and uncertainties, including statements regarding INVELTYS for the treatment of inflammation and pain following ocular surgery and the Company's lead product candidate, KPI-121 0.25% for the temporary relief of the signs and symptoms of dry eye disease, the potential for commercial insurance coverage in 2019 and Medicare Part D program coverage beginning in 2020, and the Company’s expectation to report top-line results for STRIDE 3 in the fourth quarter of 2019. All statements, other than statements of historical facts, contained in this Press Release, including statements regarding the Company’s strategy, future operations, future financial position, future revenue, projected costs, prospects, plans and objectives of management, are forward-looking statements. The words “anticipate,” “believe,” “estimate,” “expect,” “intend,” “may,” “plan,” “predict,” “project,” “target,” “potential,” “will,” “would,” “could,” “should,” “continue” and similar expressions are intended to identify forward-looking statements, although not all forward-looking statements contain these identifying words. The Company may not actually achieve the plans, intentions or expectations disclosed in its forward-looking statements, and you should not place undue reliance on such forward-looking statements. Actual results or events could differ materially from the plans, intentions and expectations disclosed in the forward-looking statements as a result of various risks and uncertainties, including but not limited to: whether the Company will be able to successfully implement its commercialization plans for INVELTYS; whether the market opportunity for INVELTYS is consistent with the Company’s expectations and market research; uncertainties inherent in the availability and timing of data from ongoing clinical trials, and the results of such trials, including STRIDE 3; whether any additional clinical trials will be required prior to approval of the NDA filed for KPI-121 0.25%, or at all, and whether any such NDA will be approved; whether the Company's cash resources will be sufficient to fund the Company's foreseeable and unforeseeable operating expenses and capital expenditure requirements for the Company's expected timeline; other matters that could affect the availability or commercial potential of INVELTYS and the Company's product candidates, including KPI-121 0.25%; and other important factors, any of which could cause the Company's actual results to differ from those contained in the forward-looking statements, discussed in the “Risk Factors” section of the Company’s Annual Report on Form 10-K and most recently filed Quarterly Report on Form 10-Q and other filings the Company makes with the Securities and Exchange Commission. These forward-looking statements represent the Company’s views as of the date of this release and should not be relied upon as representing the Company’s views as of any date subsequent to the date hereof. The Company does not assume any obligation to update any forward-looking statements, whether as a result of new information, future events or otherwise, except as required by law. Kala Pharmaceuticals announces the launch of INVELTYS and the hiring of a specialty ophthalmology sales organization.